The 1900 Patriotic Fund issue of Victoria - Specimens and Cancelled to Order. Only five examples of this category of overprint are recorded and all are shown below. Only two of the 1900 Patriotic Fund stamps were overprinted with the word Specimen because of a change in the U.P.U. requirements. These two examples are printed SPECIMEN in sans serif capitals placed diagonally approximately from the lower left corner and the font is very large (Samuel type NA2). This overprint was applied by the Natal Post Office upon receipt of the stamps from the UPU. Three stamps are recorded with an ULTRAMAR handstamp. The overprint is in blue and it was applied in Lisbon for distribution as Specimen stamps to the Portuguese Colonies - the main Post Office amongst these Colonies being in Goa, India. The 1d (1/-) and 2d (2/-) Patriotic fund stamps with ULTRAMAR overprints. The overprint on the 2d (2/-) stamp has a mirror image above the original. which has been ruled in pencil to create squares where the stamps are to be mounted. to Portuguese Colonies were handstamped ULTRAMAR prior to despatch. Provenance: Portuguese India Colonial Archives. Prestige Philately November 2005 Lot 537. Millennium Auctions June 2011 Lot 455.
as compared to the other example at left. Prestige Philately February 2012 Lot 672. No known Specimen overprints were prepared in Australia. Stamps were cancelled-to-order to sell them to collectors at a reduced price. For the 1900 Patriotic Fund stamps, various datestamps used at MELBOURNE are recorded from 1901. The Australia Post archival collection has multiples of the CTO stamps in a block of 21 for the 1d (1/-) and in a block of 30 for the 2d (2/-). Lot 74: a CTO block of 12 of each denomination. All CTO strikes in these lots were JY 28 1902. These are by far the largest multiples outside the archival collection. It is not however known if the blocks have been preserved or broken up. Horizontal pairs of both stamps, with the JY 28 1902 CTO cancellation crossing the perforations evenly between the stamps, were sold by Status Auctions in July 2002 as Lot 1472. These are probably from Lot 72 - they are certainly not from Lot 73. A most unusual use of a First Day cancellation for this issue is that on the small envelope to Kiama shown below. CTO cancels of 22 May 1900 - which is the First Day of Issue. 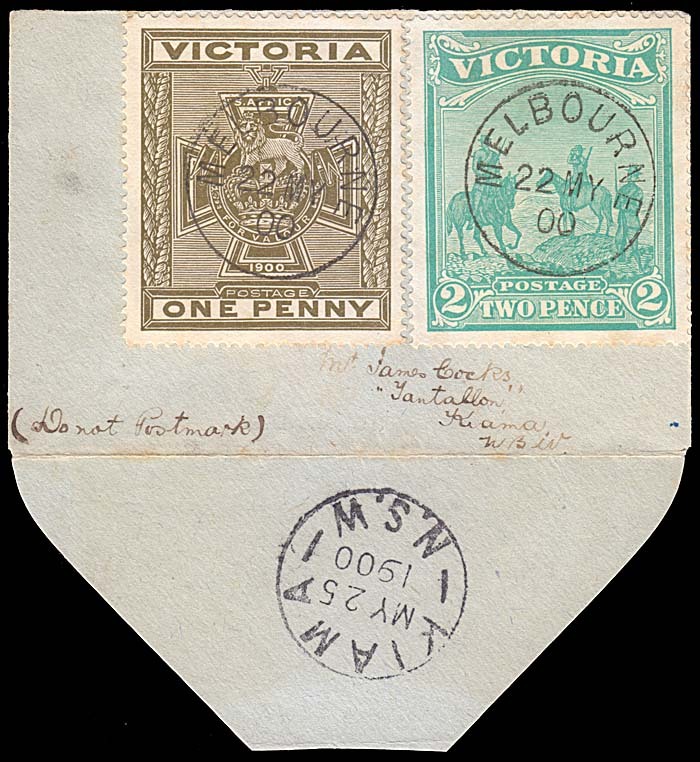 Stamps affixed to a small envelope with ms.
"Do not Postmark" and with a Kiama, NSW arrival backstamp of 25 May 1900. Most unusual postal use of CTO cancel - especially so as First Day covers in this period are very rare. Nothing is known of the history of this cover. Prestige Philately August 2012 Lot 274.
cds at Melbourne 28 June 1902. Same date as for the third pair below. Gartner October 2013 Lot 7288. 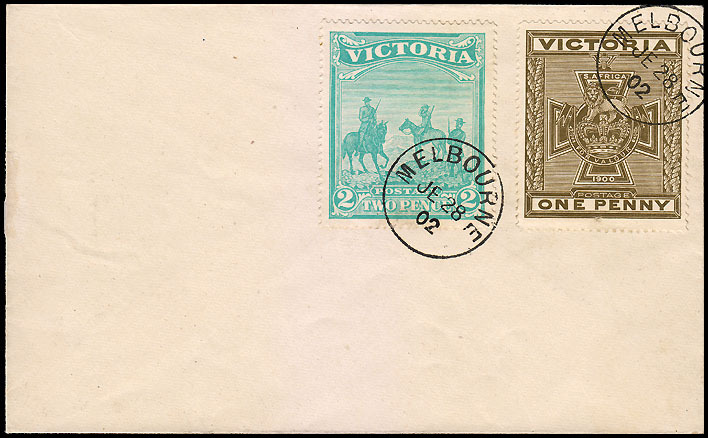 Both stamps in the Patriotic Fund issue with the rare TELEGRAPH BRANCH -MELBOURNE Victoria duplex of JA 1/01. Prestige Philately November 2006 Lot 342. Both stamps in the Patriotic Fund issue with MELBOURNE/AP 30/02 datestamp. Millennium June 2011 Lot 500. Both stamps in the Patriotic Fund issue on piece tied with a MELBOURNE/JE 28/02 datestamp. Millennium Auctions June 2011 Lot 501. Both stamps in the Patriotic Fund issue on piece tied with a MELBOURNE/JY 28/02 datestamp. Prestige Philately July 2008 Lot 491.